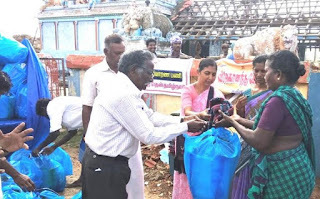 Vivekananda Kendra Kanyakumari has taken up relief work in the GAJA Cyclone affected areas. GAJA cyclone, which hit Tamilnadu on 16th of November 2018 has devastated the coastal areas especially Nagapattinam, Tiruvarur and Thanjavur districts. Coconut farms were flattened. A team of Kendra Karyakartas visited these areas and identified 1,500 families in the deep interior villages. Initially Kendra has contributed basic medicines worth Rs. 1,00,000/- which were utilised in the needy areas through Seva Bharati, Tamilnadu. On 4th and 5th of December Vivekananda Kendra Karyakartas from Madurai branch have distributed relief material worth Rs. 5,00,000/- with the support of Seva Bharati to 500 families. The kit material consisted of stainless steel cooking vessels, plate, tumbler, ladle, plastic bucket, mug, bed sheet. The deep interior villages are in and around Nagapattinam. Similarly on 23rd and 24th December, 1,000 affected families were distributed with same kit, replacing bed sheet with a mat and a kilo of rice. Sri Shanmugavadivelu of Thiruthuraipoondi coordinated the entire work with meticulous planning and execution, with the help of youth in these affected villages. it was worth Rs. 10,00,000/-. Pettai village, Muthupettai p.o. 65 nos. Thambikottai, Pattukottai, Thanjavur Dt. 15 nos. Kovilur & Sembatavankadu villages, Muthupettai 20 nos. Ekkal Vinobaji Village 55 nos. Tholacherry & Kunnur Villages 40 nos.